Nikita anxiously looked at her watch, she had waited for a week to hear back from Radha after a small argument but now, even 45minutes seemed so long. She guessed maybe Radha cracked the interview and got placed in her dream company, so she planned on this sudden meeting, to celebrate rather than talk over phone. Radha entered the cafe with a pale face, sat in front of Nikita, her eyes swollen, with a heavy heart she said "I am sorry". "Sorry for what, I have already forgotten about that small fight, can you let it go please. I can't believe you are still upset about it! ", Nikita insisted. "Niki"... she paused. "I can't do it anymore, it's not been easy for me either but I have made up my mind. This time I intend to keep my word. I know initially it's ..."
"Radha, please stop playing with me", Nikita interrupted. "I am done, I want to hide no more, lie no more", said Radha trying to hold Nikita's hand. She continued "I spent many sleepless nights thinking about the future, and I have made a decision which cannot be changed no matter what. I really did, or if I may say I do love you but..."
Nikita whispered "But! But what?". Radha's eyes filled with tears "I love you and I know you love me more than yourself, it's real between us, it's way beyond just a feeling or an emotion. But this is not enough for me! I can't live with this secret love life forever, I am not strong enough to face the society or maybe I don't want to", she said. Tears rolled down Radha's cheeks as she said "Remember my friend Manoj, he got tired of asking me to marry him, so he went straight to my parents. They have always been so fond of him that their happiness grew no bounds when they heard about his feelings for me and..", she left Nikita's hand. Radha murmured "I am getting married, I really want to". They both sat there motionless for what seems to have been a very long time. Like dead logs, listening to the sound around them but not hearing anything, seeing people talk but not understanding. "I knew this day would come, I always knew but being aware didn't mean it will hurt less. I can't blame her, Radha was always honest about her commitment. We had discussed in depth about it and had decided to be together, as long as we could. Still I feel betrayed, it feels like I am getting stabbed but I can't run away from it", thought Nikita. Radha wiped her eyes, quickly drank a glass of water took a deep breath and said "Your absence in my life will create a space which can never be filled, but I just hope as they say ,'Time heals everything', time would heal our pain if not everything, it will give us the strength to remember each other as a beautiful part of our lives, that miserably beautiful part which can never be expressed to anyone because even if we tried no one would try to look beyond the fact that we belong to the same gender, that's the start and end of our love, physical aspect would be considered but not our deep emotional connection, man made society rules would be brought up but not the true love we share." Nikita knew this is the final farewell, her heart sank with a thought that she is never going to see Radha again there was so much she wanted to say but all she could do was sit there and nod her head when Radha said "I have to leave, take good care of yourself and...", she could say no more. She picked her purse, looked at Nikita for a long time and then pushed her chair behind, stood up, she knew she had to leave now. Few minutes later, Nikita came back to her senses, she realized Radha had left, she cursed herself because she wanted to tell Radha for the last time that 'She loved her..
"The only solace being, the secret remained." Such a emotionally powerful tale so beautifully narrated. Nicely narrated.. Some solaces remain for a lifetime.. this girl's love is one such..
Ah! 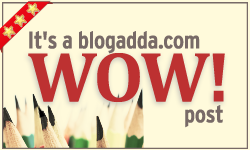 This is the story about which you started the thread on Indiblogger. I liked your narrative style - captures emotions nicely. Thanks ! Yes i started the thread with a simple question DO u accept same gender Love? But the thread got just off track, I was so shocked to see the replies which took the discussion to some other level and totally irrelevant debates were brought in. SO I was at loss of words, couldn't actually say anything. Shows the angst of the characters so clearly. Very nice. I really need to hear that :) Thank you so very much ! Painful. Why love is caged within barriers in our society? I don't understand what sort of ideals do our society wishes to keep up to. This was a great story. I hope people understand that homosexuality isn't just about sexuality, but emotions are too attached. brilliant narration . i hope people understand the true meaning of a relationship ! a narration that compels you to heave a deep sigh otherwise you may get involved with any of the characters.